After wind, rain, sleet and hail earlier in the day, the weather improved considerably for the first of the evening time trials at Betteshanger CP. It was still very chilly, but the sun came out and the winds fell away to leave just a slight breeze. There was a total of 30 riders taking part, including 8 junior riders. The first junior rider was Fabien Large of Nopinz with a very good time of 22.09, which was also the second best time of the evening. 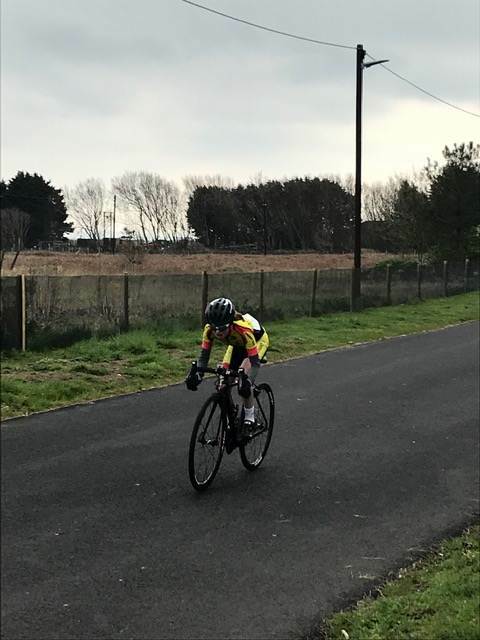 Catherine Morrell was the first of the Thanet RC juniors and also first girl with 28.30. First Thanet RC boy was Alex Dack in fourth place in a time of 29.12. The fastest senior rider was also the fastest woman. This was Emma Lewis of the Independent Pedaler, who came in with a fine time of 21.27. In second place was the fastest male and first Thanet RC rider, Shawn Manning, who clocked 22.23. 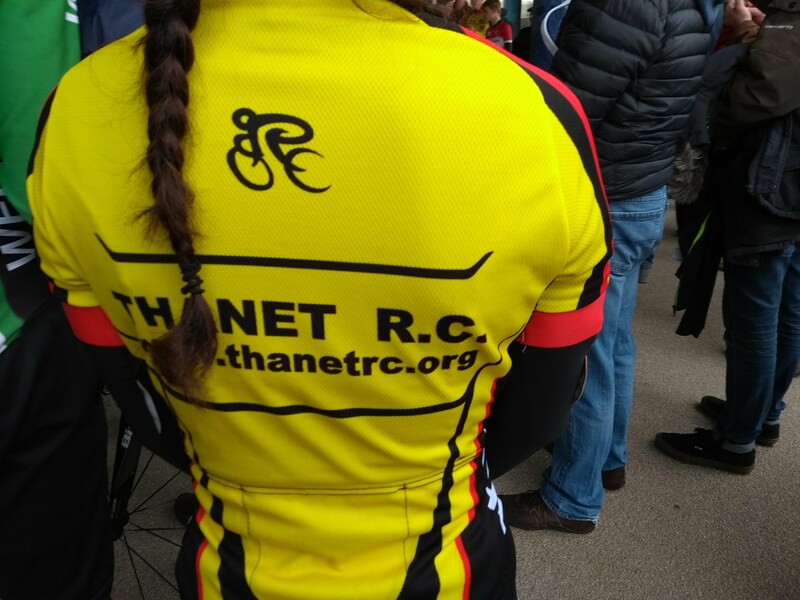 Emma Davis was riding her first club event for a number of years and was the first Thanet RC woman with 29.09. Two more riders making an appearance at a club event for some time were Jason Wares and Martin Dickinson. Welcome back. Please see the PDF files for the times of all riders. The band of helpers this week was Sue Shields, Jenny Fearn, Terry Fearn, Matt Hall, Nick Scott, Michael Friend, Andy McCall and Dave Mastin. It was a long journey up to the Isle of Grain for a large number of club riders to ride the VTTA Kent 10 mile TT, organised by Val Peachey. In total, 21 club members entered the event, out of a field of 56. In that large group of club members, it was encouraging to see no fewer than 7 women taking part. Conditions were quite challenging with a stiff headwind on the return leg, not helped by the exposed nature of the course. In particular, the last two miles into Grain were tough. The club had some success with Nic Fennell coming first on scratch with an impressive 21.01. There were no separate women’s prizes, and I don’t know who won the vets standards prizes, as these were not displayed on the results board. Go-Ride Sessions Starting 30th March! The Club’s Go-Ride sessions start again on Saturday 30th March 10-11am. Discovery Park have very generously allowed us to use an oval cycle circuit located on their site in Sandwich. The oval is totally traffic free and there is parking only metres away. Sessions cost £2 per child and will run every Saturday from 10-11am for children of any ability. These session will be most suitable for children aged 4-12 years, however they are open to all. 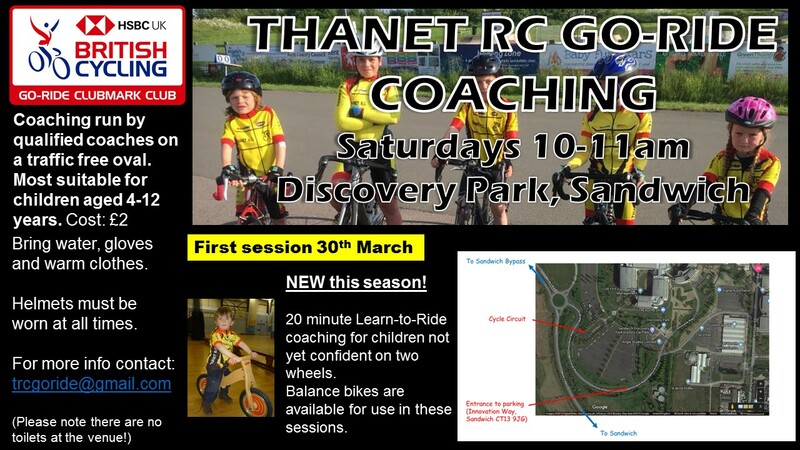 Alongside the Go-Ride coaching session, we are also running a learn-to-ride session 10-10:20am for children not yet confidently riding o two wheels. The club can provide balance bikes for children to use in these sessions. I have attached the flyer (including directions) if you would like to share it with friends or schools, we look forward to seeing you there! 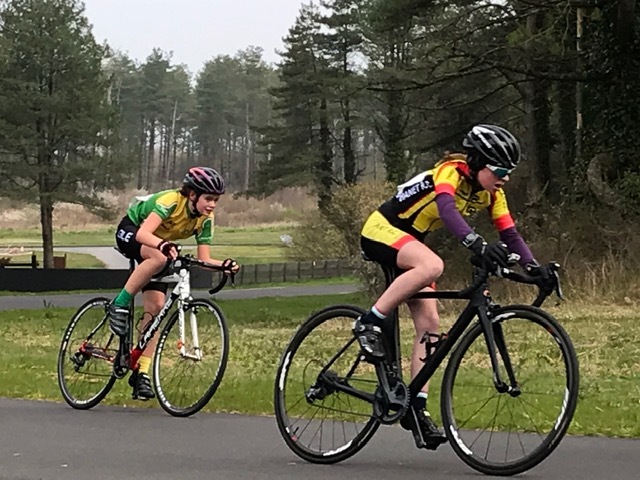 Last weekend Harriet had two wins at Milton Keynes and Stourport-on-Severn. William had 2nd and 6th Tallulah still waiting on results as was sprint finish.